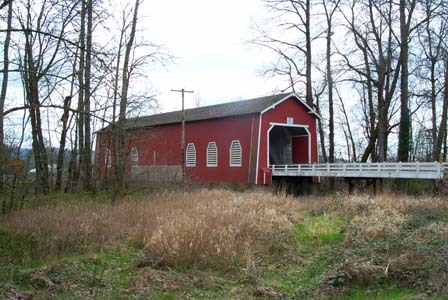 There are numerous covered bridges to be found in Oregon’s Willamette Valley. Many of these covered bridges are still in use, yet others have decayed into an unusable state of disrepair. A few of these covered bridges have been restored for historical preservation and are adjoined with sprawling parks and nature trails. Near the little country community of Scio, Oregon, you will find a pleasing drive on which to visit five different covered bridges. All of these bridges are still in commercial use. Be forewarned, many of these bridges have only a gravel turnout on which to park your car, unless noted there are no facilities near the covered bridges. Just five miles north of Scio is the community of Stayton, Oregon. Here you can visit Pioneer Park and see the re-constructed Stayton / Jordan Bridge.